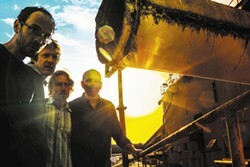 The Absynth Quartet plays New Year's Eve, Thursday, at Humboldt Brews. Show starts at 9:30 p.m. and tickets are $17. The holiday season has come to a close; another year behind us, and more importantly, another year in front of us. Another successful circumnavigation around that glowing nuclear orb we call the sun. Without turning this into an astronomy lesson, we are roughly in the same location in relation to the sun that we were last year, but we're far from being in the same place as we were a year ago, in the grand scheme of things. Our solar system is taking its trip around our galaxy. So we're actually in a very different place than we have ever been, even if it feels the same. It is with this hope that many of us wish for a more peaceful world. I am hard pressed to think of a time when peace isn't superior to its alternative. If one follows national news outlets — which often peddle in hopelessness — it is easy to feel overwhelmed with how quickly the hell-bound handbasket is travelling. However, if we take a step back and look around us, especially on the local level, it becomes clear how much potential for good this new year holds. The future is not only unwritten, but most importantly, we all hold pens. So whether you choose to celebrate the new year and Manifest the Peace (more below) and join your neighbors at The Jam, or you celebrate more privately, realize the power to change and the path to peace begin within. It's New Year's Eve, and there are some lucky bands out there that got booked where the crowds are sure to crush it. At The Jam, you'll have a great time getting down to locals Motherlode and Object Heavy. The show starts at 8 p.m. with the bands alternating sets and jamming late, and includes a free champagne toast at midnight with the $12 ticket charge. 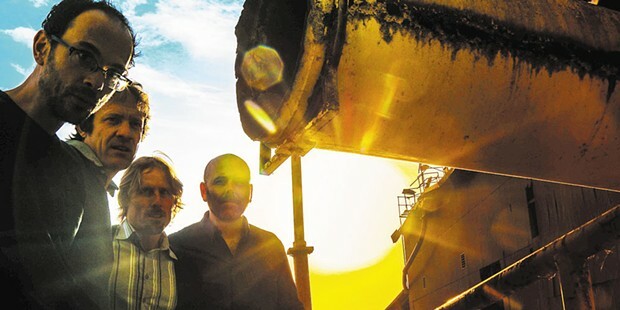 A few blocks away, locals The Trouble will start the show off at Humboldt Brews at 9:30 p.m. followed by annual NYE regulars The Absynth Quartet for $17. Expect a great show with barroom blues and bluegrassy moves. If free admission's a bit more to your liking, Six Rivers Brewery hosts the Jim Lahman Band at 9 p.m., and then, up in the Lake o' Blue, Nighthawk starts at the same time for the same price at the Blue Lake Casino & Hotel. Happy New Year! It's the first day of 2016, and what better day to celebrate peace? As mentioned above, The Jam in Arcata will be hosting Manifest the Peace starting at 7 p.m. Local talent will get the spotlight; the Jam's Pete Ciotti tells me "poets, songwriters, bands and DJs" will be entertaining the crowd with an emphasis on "creativity and [a] positive outlook". All the money raised will go to the third annual Increase the Peace benefit, which will donate all of its profits to KHUM's "Stop the Violence" campaign. Donations are on a sliding scale, so give what you can before you dance for peace. It's an all-ages show until 10 p.m., at which point it'll be for the 21-and-over crowd. Give peace a chance. Genetically linked rockers Doug Fir and the 2x4s will be at Cher-Ae-HeightsCasino at 9 p.m., entertaining you for free. Had Frodo and Samwise started a band with some of the orcs behind the gates of Mordor, perhaps they would sound like Ice Sword, which will rock the Alibi in epic style at 11 p.m. for only $3. Don't think of the Flagstaff band's "fantasy metal" in the sense of some yet to be discovered element, but rather dramatic heavy metal with some influences of renaissance and classical music. As usual, you'll find Buddy Reed rippin' it up at Libation off the Arcata Plaza. Also as usual, he's not asking for your money when he goes on at 7 p.m.
Also free are the Opera Alley Cats, who will be playing jazz at the Speakeasy in Eureka starting around 7:30 p.m.
Andy Powell is a congenital music lover and hosts The Night Show on KWPT 100.3 FM weeknights at 6 p.m. He hopes to learn how to write well in 2016.